So I feel like I'm teasing you, but I wanted to let you know I'm working on her pattern tonight. I think I'm going to name her Iolani, from the information I can find, it means bird of heaven, and when I look at the colors I used on her I'm reminded of birds of paradise. It's also the name of the palace where the last Hawaiian monarchy lived and where Queen Lili`uokalani was imprisioned. I don't know what the heck I was doing with my camera when I took pictures to explain the lei in the pattern, but I must have changed something drastically since there is a ridiculous amount of noise in each of those photos. I'm trying to fix them and lighten the finished doll's photos, I'm concerned about the colors and light in all the pictures- are they coming out well for you? What do you think- am I being copied? I think I'm being copied. It's not in crochet, but it appears to be pretty blatant. A site called Doodle Palace is selling digital stamps that look eerily similar to mine. Take a look for yourself and let me know what you think! I had contacted them about it, and thankfully I received an interesting reply today with an apology and assurance that they had removed to images off of their blog and website. 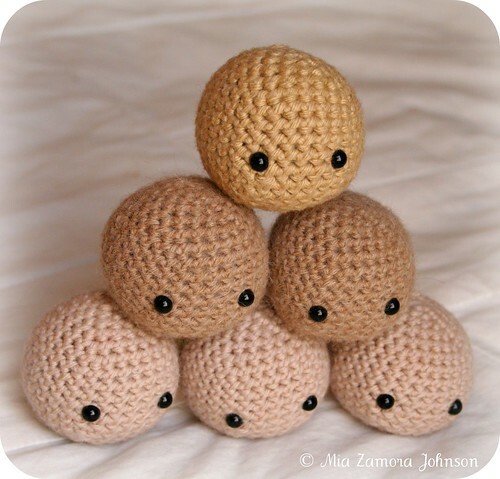 When I'm designing a doll that I will be selling the pattern for, I do my absolute best to find images of anything similar to make sure that I'm not copying someone, even inadvertently. I just expect that anyone else who does what we do would hold to the same standards too. It's unfortunate that that doesn't always happen. Within the last year or so, I just have gotten very discouraged by all the copying and pattern sharing on forums, and chasing down and all of the not fun stuff that has to do with designing these patterns. Unfortunately I let that get to me to the point where I don't want to share what I make, but I do realize that almost all of the people that purchase my patterns do respect my work and my copyright choices and I wanted to let all of you who do follow the rules- I really appreciate you! 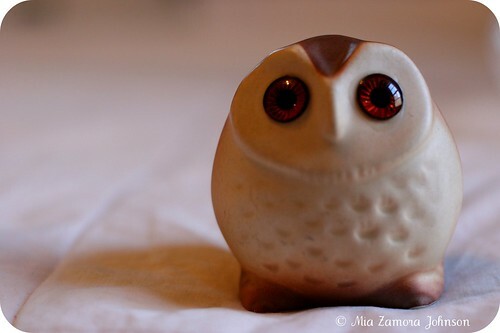 I just wanted to let you know that I started an Owlishly Flickr group. 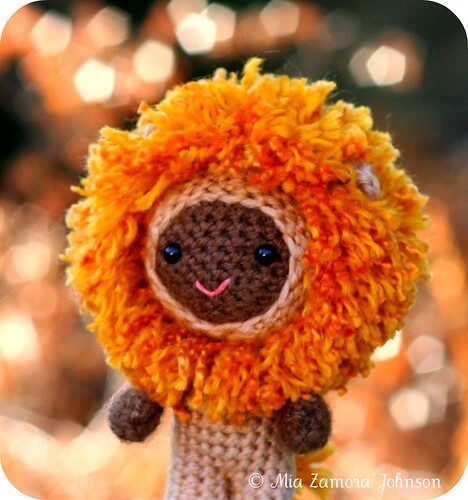 I love seeing dolls and toys that you've made from my patterns, and I'm sure that others would like to see them to get ideas as well. I've invited some of you who I've found by searching for "owlishly" on flickr, but don't feel left out if you didn't receive an invitation from me. 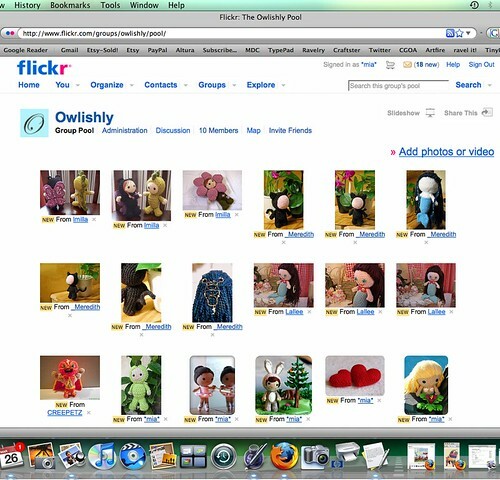 Please join the group and add pictures of the dolls and toys that you've made from Owlishly patterns, it'd be great to have them all in one place! 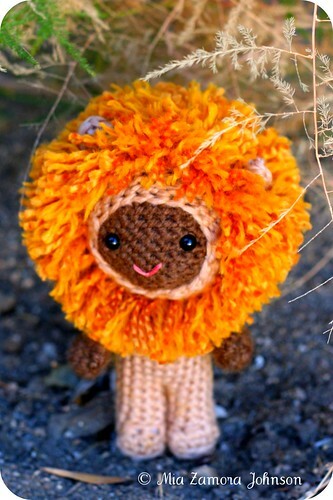 He wanted a lion boy :) I made him look like one of my childhood friends. Marcus' dad had gone to high school with my mom & dad and they all got reacquainted planning their 10 year reunion. After that our families were fairly inseparable for the next 10 years. Marcus' parents went on a safari to Africa and came back with fantastic treasures and while making this little boy, I was reminded of them a lot. As usual, I hope to get to the pattern soon, but geez, the way things go around here, I don't know when I actually will. I've also been working on heads :) I find they're good to make when I'm undecided on what to do next, or trying to figure out in my own head what I want to do with a certain doll before actually trying it out. It was certainly a challenge balancing them long enough to snap their image! Then this is a little owl that I couldn't resist from Etsy seller the buttercup! Super, super cute! I used that big CF card for these and wasn't able to upload them on my computer, a cd came with the card but I can't even use that because it's one of those itsy bitsy cd's and it doesn't work with my laptop. So annoying. I have to go get images printed/archived onto cd's before being able to upload the images from that CF. Anyone with a lot more knowledge than me know how to fix that? Any help will be MUCH appreciated! I'm fairly happy with the way the pattern turned out, I've included 22 images that'll hopefully help explain what I say when I try to give instruction *wink* You know, I try to take the best pictures I can and I'm usually pretty pleased with them, but when I save the patterns as pdfs I end up doing it at the "good" level, instead of "better" or "best" just because the files would be humongous! I wish there was a way that the picture quality was as good as they are in the original pattern, but I don't know how to do that without having files that would crash people's email boxes. Anyway, I think I'm being a bit loopy 'cause I'm so stinkin' tired. So off to bed for me! I went to Joann's tonight to look for purple yarn for my little octopus boy, and as usual, on the way to the back of the store to check out the yarn I check the books. 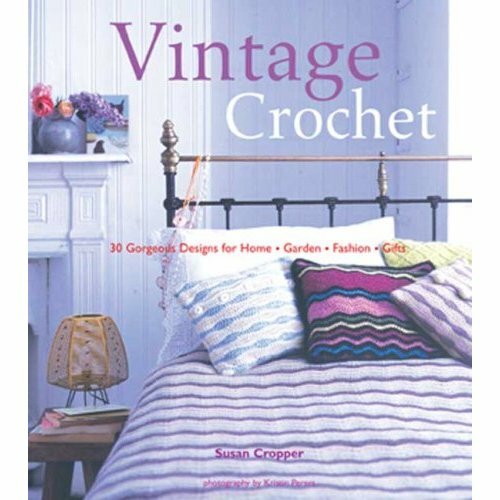 The books at my local Joann's aren't organized worth spit, and this drives me batty, but on an eye level shelf, beckoning me, practically jumping into my arms was Vintage Crochet! I've been waiting for this book to show up there. I wasn't going to buy it until I could get a super duper deal on it, and I caved in a moment of weakness. I was going to buy it full price since I'd used my January mailer coupons already on the borders & flowers books. I got the yarn I needed and went to pay and was mentioning to the wonderful employee that was checking me out that I'd already used my coupons, but had been waiting for this one to show up. She found another customer's mailer that wasn't going to be used and scanned the coupon for me- yay 40% off! How fortuitous! I've been pooped lately, and actually fell asleep while nursing my daughter to sleep, but since I had tons to do tonight, I'd forewarned my husband that if I did fall asleep I'd need him to wake me up. He'd gone outside to workout while I got the kiddos to bed, and came back in to move our little guy out of our bed into his own, and I popped awake. I'm assuming it's because for the past 4 years I've been waking regularly to soothe and feed a child that I don't sleep very soundly. It's weird too, because I feel like I haven't slept at all, tonight even, but my husband said that I was snoring when he went in to move our little guy. Anyway, I'm in the midst of typing the pattern out for the sheep and the angel, since it is late again, it's probably not going to be ready until tomorrow or Sunday. I also plan on taking a lot more pictures of the little lamb, I need better light than I have access to at 11:52 pm. So, I'm off to finish up some pattern writing for tonight, and trying to get enough rest to be a functioning mama tomorrow. One last thought, it is ridiculously easy to get sucked into the vortex that is Ravelry. I love it, but I can look for something there in the forums and then look up and it's like 2 hours later. Man alive. So I was at flickr right now looking at this image and just noticed the edit this photo option- how nice is that! I was able to fix the colors without doing it in photoshop or iPhoto, which saves time for me! Anyway, this is closer to what she looks like in real life, I *really* like the yarn, I bought it when I was visiting my aunt at her LYS and I think I left the label in her car when I was winding it in a ball, so now I have absolutely no idea what yarn it is, except that it's a superwash wool. 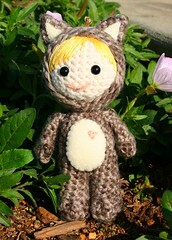 Okay, off to finished up those commissioned dolls!